Escape the heat-or the rain-with these indoor water options. NO SWIMSUITS REQUIRED Kids get up close with the Shedd’s sea creatures and still stay dry. This indoor ice rink is perfect for a noncommittal open skate. Want to take it up a notch (i.e. not fall every ten seconds)? Six-week lessons cost $39–$75 and start June 28. The center is Park District–run, so you have to go through the rigmarole of in-person registration. Sign up on June 17: Take a number at 4:45pm and wait for it to be called, starting at 5pm. 3845 N California Ave (773-478-2609). $2–$5. Skate rental: $3. Another cool option Centennial Rink in Wilmette. It’s indoors and right next to the outdoor pool, which is open to nonresidents for daily passes. 2300 Old Glenview Rd, Wilmette (847-256-9666). Open skate: $3.50–$7.50. Skate rental: $3.25–$3.75. Think your neighborhood swimming pool is big? 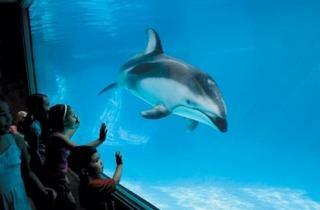 The Shedd’s pools contain a combined 5.2 million gallons of water. 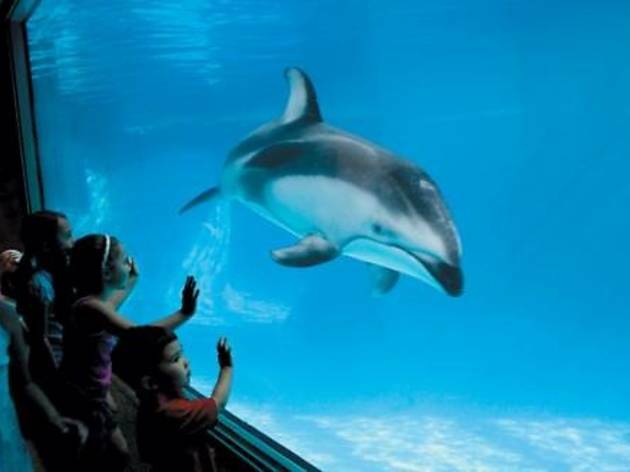 Kids can learn about the 8,000 marine species at Polar Play Zone’s touch pools, the beluga-filled Oceanarium pool and the shark-filled Wild Reef pool. Prepare to get wet at the Shedd’s newest addition: a 30-minute, 4-D version of the popular flick Happy Feet, where tubes attached to the seat in front of you tickle your face with a few surprising sprays. 1200 S Lake Shore Dr (312-939-2438, sheddaquarium.org). $17.95–$24.95. Discounts for Chicago residents. Another cool option Soak up the physics of waves at Museum of Science and Industry’s Omnimax film Ultimate Wave Tahiti. 57th Street and Lake Shore Dr (773-684-1414, msichicago.org). $23, seniors $21, kids ages 3–11 $16. Discounts for Chicago residents. Through Oct 26. Rising coastlines and melting ice caps—these water-related occurrences might be part of our future, no thanks to global warming. In the traveling exhibit “Climate Change” (Jun 25–Nov 28), older kids can learn more about greenhouse gases. Displays include a robotic diver that brings back information from deep in the oceans. 1400 S Lake Shore Dr (312-922-9410, fieldmuseum.org). Time-ticketed admission: $15–$22, second Mondays free. Discounts for Chicago residents. Another cool option MSI’s “Science Storms” blows the lid off tsunamis, avalanches, vortices and other weather phenomena. The indoor garden at this botanic paradise houses the “Sugar from the Sun” exhibit, where you can learn about photosynthesis. Bonus: Like the plants, you can stand under mist spraying at the entrance to four paths, all lined with a high-tech sound system that reacts to the environment. On weekends 11am–4pm, kids can help water plants in the Elizabeth Morse Children’s Garden. 300 N Central Park Ave (312-746-5100, garfieldconservatory.org); free. Another cool option Grow a family garden. Stop by the Chicago Center for Green Technology to pick up tips. 445 N Sacramento Blvd (312-746-9642, greentech@cityofchicago.org). Free. Until 1970, the Shedd had seawater shipped in for its saltwater exhibits. Since then, the aquarium has made its own.